It's that time of the year again. Time to start the WWE 2K hype train. 2K has announced on their Twitter that their yearly roster reveal will begin tomorrow on IGN. No word yet on what time. Now the only problem I have with this is that at this point in the WWE series, I feel like we don't really need a roster reveal anymore except for Superstars that are going to be making their debut in this years game. We have finally gotten to the point in the series where almost the entire current day WWE roster makes it into the game. 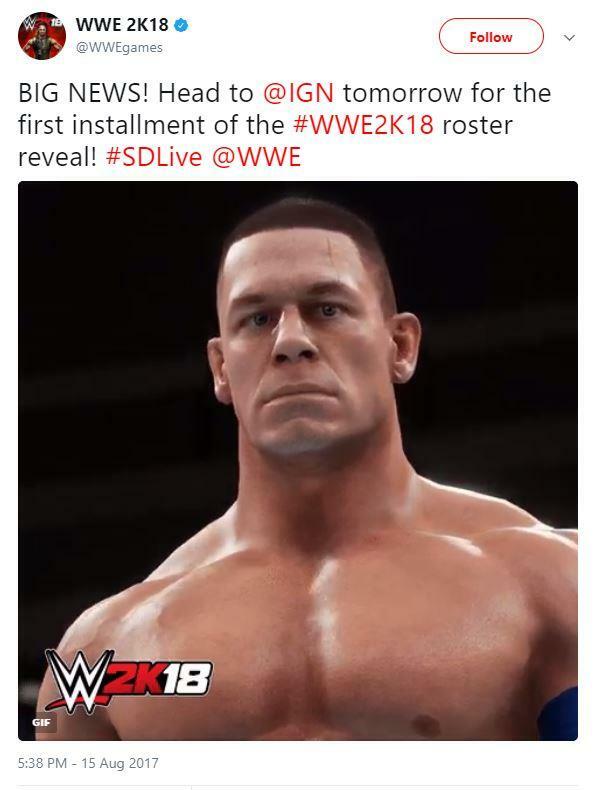 While I am excited about the reveal, I fear its going to be something like John Cena, Roman Reigns, AJ Styles, Sasha Banks and Stone Cold being announced. Come on, we know they are 100% going to be in the game. That said, the yearly roster reveal is always exciting. I remember in years past I, along with other WWE games fans would anxiously wait the roster reveal to see who and who wouldn't make the roster. In the Smackdown vs. Raw era, there were always current roster superstars who would, for whatever reason, just be left out of the game. The Uso's were a good example of that. I think it was like three years in a row they wouldn't be in the game.